Chung Hyeon continued his impressive run at the Australian Open on Monday after he beat former world No. 1 Novak Djokovic to become the first South Korean to reach the last eight at a Grand Slam event. Chung produced another upset at the Australian Open after he knocked out Djokovic 3-0 (7-6 (7-4), 7-5, 7-6 (7-3)) in the round of 16 contest at Rod Laver Arena in Melbourne. He reached the last 16 at the season‘s first grand slam event with a surprising win over world No. 4 Alexander Zverev on Saturday. This was Chung’s second meeting with Djokovic. The two players previously met in the first round of the 2016 Australian Open, where Djokovic defeated Chung in three straight sets and went on to win his sixth Australian Open crown. Chung will next face 97th-ranked Tennys Sandgren of the U.S., who also had an upset win against fifth-seeded Dominic Thiem of Austria, in the quarterfinal on Wednesday. Chung is now the first South Korean tennis player to reach the last eight at a Grand Slam tournament. Previously, Lee Duk-hee in the women‘s singles at the 1981 U.S Open and Lee Hyun-taik in the men’s singles at the 2000 and 2007 U.S. Opens had reached the round of 16. Chung, currently highest-ranked South Korean male tennis player at No. 58, had a good start by winning the first four games against Djokovic, who has dropped to 14th in the world rankings while battling injuries. The 21-year-old South Korean, appearing in his third Australian Open, took the opening game following a double fault by Djokovic and then went on to win the second game with a backhand winner. He made 4-0 as Djokovic struggled with unforced errors. Djokovic, who has 12 Grand Slam victories, however, started to find his rhythm as he won three straight games to make 4-3. He failed to hold serve in the next game, but finally leveled the score at 5-5. Djokovic then moved ahead 6-5 after Chung lost the break point with a forehand unforced error. Chung, however, managed to force the set to the tiebreak by taking the next game with a forehand winner. In the first set tiebreak, Djokovic drew the first blood, but Chung made the score 3-3 and went on to take three points. Chung then wrapped up the set with a backhand that drew an error from the 30-year-old Serbian. 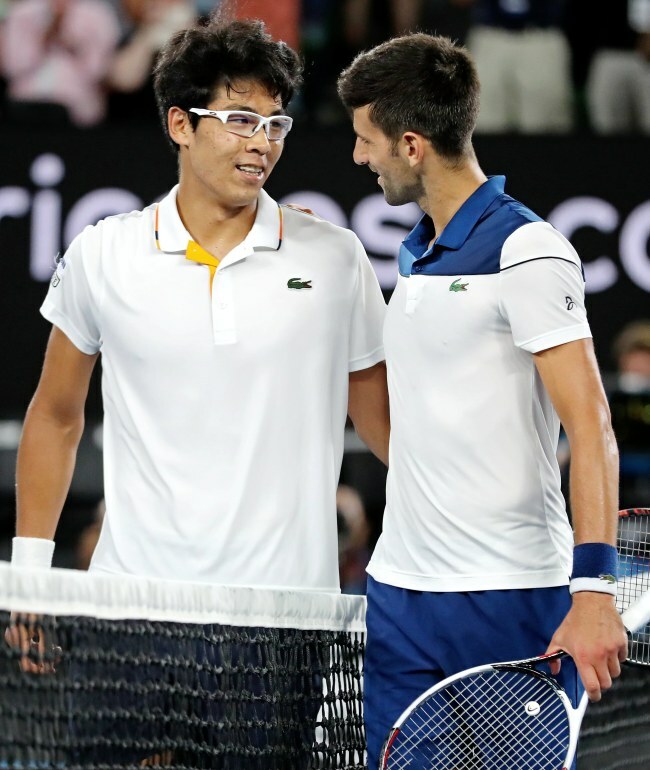 Chung and Djokovic, who received treatment for his elbow and apparently for blisters on his feet after the first set, continued their intense rally in the opening of the second set. But it was Chung who secured the lead by saving four break points. The second set had a similar story to the first: Chung moving ahead first and Djokovic catching up later. Chung cruised to a 4-1 lead at one point, but Djokovic fought back to make it five-all. Chung, however, managed to secure the set in 61 minutes as he held his serve and breaks against Djokovic, who has 68 Association of Tennis Professionals (ATP) titles under his belt. Djokovic broke Chung, who only has one ATP win, to start the third set, but his lead didn‘t last long, as Chung took the next three games for a 3-1 lead. Djokovic, a five-time International Tennis Federation (ITF) champion, later made the score 3-3, with his first serve ace coming 2 hours and 41 minutes into the match. The two players then each held their serves and entered another tiebreak. In the third set tiebreak, Chung earned three quick points, but surrendered the next three points. After a rally of more than 20 shots, Chung broke the 3-3 deadlock with Djokovic’s unforced error and then went ahead with a forehand winner. Following a Djovokic forehand return that hit the net, Chung made history by earning the match point from his opponent‘s wide backhand. Chung said he was happy with his performance against his idol. When asked about his third set, Chung said he didn’t really feel any pressure. Chung said he will give a better performance in the next round against Sandgren.